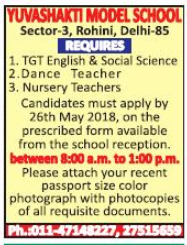 Yuvashakti Model School, Delhi has advertised in THE HINDUSTAN TIMES newspaper for the recruitment of TGT vacancies. Interested and eligible job aspirants are requested to apply with in 26th May 2018. Check out further more details below. About School: Yuvashakti Model School is one of the leading schools in Delhi. It was founded more than two decades ago in 1985 by Late Sh. M.L. Sharma and Sh. B.R. Sharma to impart value based education and thus contributes for the betterment of the society. The School prides itself on having an excellent infrastructure, a unique play way area for toddlers, a multipurpose playground, a skating rink, a badminton court, a basketball court, a table tennis room and well-lighted and ventilated classrooms.